This year’s Psychology Postgraduate Affairs Group (PsyPAG) conference was held at the University of Northumbria. Political ideologies seem to have strong geographical correlations, the southern states of the USA being extraordinarily conservative while northern states lean left. Brian O’Shea (University of Warwick), who received the Rising Researcher Award at PsyPAG, has examined the role of parasites and diseases to help explain the ultimate causal factor for how these beliefs emerge. Those who support either conservative or liberal ideologies tend to differ: conservatives tend to be older, more religious and prejudiced towards outgroups, while the opposite is true for liberals. Political beliefs have been explained by personality, social contagion and family upbringing, but what if there was one overall factor that made it more likely a person was left or right leaning? Infectious diseases are the number one cause of death worldwide, O’Shea said, and, given their devastating impact, humans may have developed strategies to slow their transmission. Parasite stress theory suggests people in areas with low disease rates are more likely to have liberal ideologies, and a more open worldview, and higher-disease-rate areas have more conservative people. This goes some way to explaining the fear of outgroups seen among conservatives: perhaps those in high-disease-stress areas may avoid contact with outgroups to avoid catching diseases. As a catch-all rule, countries that are further from the equator have fewer problems with diseases: even within the USA disease rates are higher in southern states, which also tend to be more conservative. Indeed, when examining beliefs among those in high-disease-rate areas we find more collectivist cultures with restricted sexual practices. They tend to be conformist and ethnocentric, and these patterns remain even when applying control variables. When people are primed with pictures of diseases they are more likely to see others as more dissimilar – O’Shea said this suggested people employ avoidance strategies when they feel the threat of disease. O’Shea has been working with Project Implicit, an online virtual laboratory that has collected data from people in the USA on multiple measures such as political ideology, religious belief, right-wing authoritarianism and social dominance orientation – which reveals social and political attitudes. His research assessed whether those in regions with higher disease rates were more conservative. O’Shea also looked at infectious disease rates in every state over a 15-year period. He found that for those living in US states with higher disease rates, parasitic stress was a significant predictor of more religious beliefs and a more conservative worldview (even when controlling for age, gender, education, income and population density), and those people were more likely to endorse right-wing beliefs. He also found that parasitic stress predicted social dominance orientation, particularly the dominance subscale which measures beliefs about dominating outgroups. O’Shea also used the Implicit Association Test, which uses photos and either positive or negative words to supposedly reveal racial bias. People in higher-disease-rate states had higher implicit and explicit prejudices towards all sorts of outgroups. White people in states with high disease rates had an increased preference for white people, and the same was true for black people experiencing higher disease stress, who preferred black people. O’Shea’s work reveals that people in areas with high disease stress tend towards having more prejudice towards outgroups, which could be explained by avoiding disease transmission. He suggested the efforts governments make in reducing diseases could be used to improve relationships between groups and promote progressive values. For the uninitiated, sending sexual texts is also known as sexting, and ongoing research seems to indicate it’s more common among adults than you might think. Dr Zara Brodie and Dr Claire Wilson (both University of the West of Scotland) found more than 70 per cent of their sample had sexted in the previous six months. Brodie and Wilson were keen to look into the emerging phenomenon, which hasn’t been researched in great depth yet. In earlier studies of sexting, prevalence rates have shown between 9 and 39 per cent of adolescents do it, while 45 to 55 per cent of adults have. Similarly, the effects of sexting on relationships, and the personality and social factors that may predict sexting, are near unknown. As the researchers pointed out, while we may fear sexting, and perhaps with good reason, there’s a chance it can have positive effects on relationships. So far Brodie and Wilson have almost 200 participants between the ages of 17 and 58 who have completed online questionnaires about their sexting behaviour, social learning theory factors, ‘dark triad’ and ‘big five’ personality tests. Just over 72 per cent of that sample had sexted within the last six months, 72 per cent of those were to a romantic partner and 39 per cent to ‘someone else’, which can include casual partners. This leap in prevalence compared with earlier studies may be an anomaly, but Brodie suggested it could indicate wider acceptance of sexting. Younger people in the sample tended to sext more, and more males than females sent sexual messages. When looking at the results in the context of social learning theory people were more likely to sext a romantic partner if they had positive attitudes towards sexting and had friends who did the same. The same applies to those sexting someone else, but reinforcement from the recipient was also an important factor – perhaps, the researchers suggested, in the early days of sexting we need to feel that it will have positive consequences. Quite surprisingly, the only personality factor that has, so far, shown to have a significant relationship to sexting is Machiavellianism. Perhaps those on the higher end of psychopathic or narcissistic scales have more problems in close relationships. Machiavellianism has also been linked to sexual deception, which could explain the link. The researchers also found sexting wasn’t related to sexual or relationship satisfaction, but it’s worth remembering these are preliminary findings. 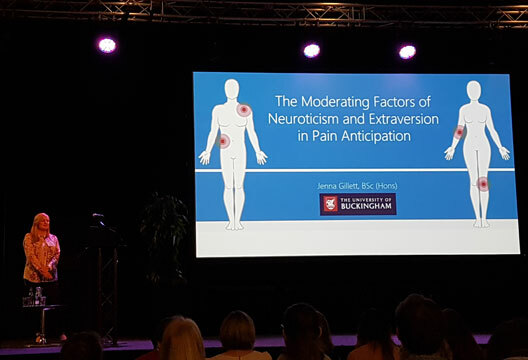 Jenna Gillett’s (University of Buckingham: pictured above) dissertation research, which has been recently published in the British Journal of Pain, received the Undergraduate Award from PsyPAG and has been honoured by a prize from her university. She wanted to explore whether extraversion, neuroticism and the anticipation of pain had any impact on how painful the dreaded cold-pressor experiment was for participants. Pain has psychological and physiological elements, and the mere anticipation of being hurt can make the actual sensation seem worse. Gillett outlined various studies in this area, including how negative pain expectation leads to this worse experience of pain. Gillett also wanted to assess whether low extraversion and high neuroticism played a part, given that those with neurotic tendencies experience more headaches, while more introverted people feel pain more intensely. Females and older people also have lower pain thresholds, while redheads have higher pain thresholds and tolerances. The picture of pain is obviously a complex one. Volunteers from the Buckinghamshire area were given questionnaires on neuroticism, extraversion and submissiveness – to control for how suggestible people were regarding the anticipation manipulation. They then went through the cold-pressor test – essentially a container of 1°C water which they placed their hand into for as long as they could, up to a safety point known only by the researcher. Participants in an intense pain condition were told the average length of time most people held their hands in the water was 30 seconds – thus increasing their negative anticipation of the experience. Others were in the moderate pain condition were told the average time a person could usually withstand the cold pressor was four minutes. When comparing pain tolerance from the intense and moderate conditions Gillett found people’s pain thresholds were almost double in the moderate condition. People seemed to be detecting pain much quicker when they were told most people could bear the pressor for only 30 seconds. However when assessing the difference between the experimental groups and control group, who just carried out the cold-pressor, there was no significant effect of anticipation on people’s pain tolerance and threshold overall. She also found that neuroticism and extraversion didn’t moderate the effects. Gillett said she had a more extraverted sample than average and the control and moderate pain groups were very similar in their pain tolerance and threshold, which could go some way to explaining these results. However, this research has still examined a new area in a novel way, and with more exploration could lead to pain relief interventions for those personality types who may need it. Other awards at the conference were the DART-P and PsyPAG teaching award for Sophie Homer (Plymouth University), and the Masters Award for Jessica Barber (Royal Holloway, University of London).